Last October, Total Film Indonesia found itself in a bind. The phone number given to TFI to call one of the biggest names of the third season of AMC’s The Walking Dead, David Morrissey, was not working. Only after dialing repeatedly, did we manage to get connected. Even then, we were asked to wait for a few more minutes for David’s arrival. All we could think about was: screw the phone bills – as long as we get to talk to The Governor. Or, should we say, the guv’nor? Well, we’re not only totally crazy about the show. We admit to being obsessed with TWD the way zombies are obsessed with eating human flesh – the series is dramatic, intense and stunningly star-studded – but Morrissey is a bit of our hero as well. We’ve seen him in Basic Instinct 2, Derailed, The Other Boleyn Girl, Centurion, Blitz… and recently he was in Hollow Crown, BBC’s Shakespeare mini-series, in the Richard II part of the show along with Patrick Stewart, James Purefoy and 007’s new gadget man, Ben Whishaw. And our inner geek also recalled his outing with Tenth Doctor David Tennant in The Next Doctor, a Christmas special of Doctor Who. Let’s talk The Walking Dead, your first ever zombie gig. Is there a difference between playing in a zombie series and the other things you’ve done in your career so far? Yeah, I’ve not encountered many zombies in my acting life so far. They’re very real. I think one of the wonderful things about being in the series is Greg Nicotero, who is the head of the special effects that do such a brilliant job, that you really don’t have to that much of your imagination to imagine what it would be like to be confronted by these terrible things. And the guys who play them, I’m told, come at 4 in the morning and then have them go into make-up and stand under the terrible Georgian heat. They are wonderful people who work very hard to bring these characters to life. So, yeah, it’s a challenge but it’s also wonderful to do. I think it’s an amazing creation done by an amazing team. 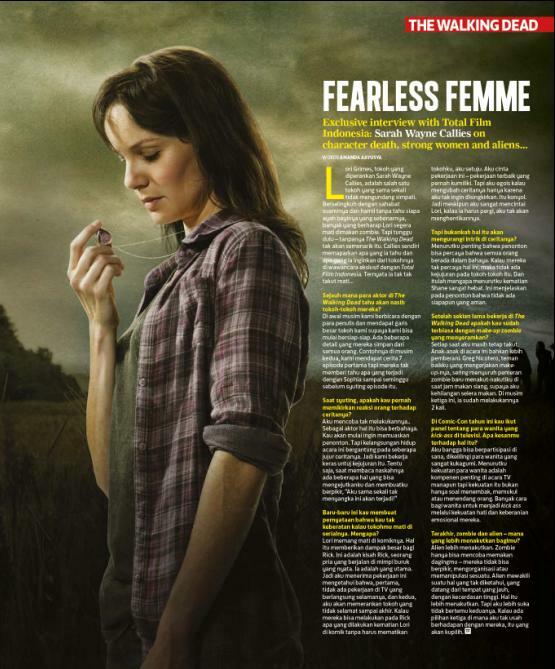 Back in August, I had the privilege of having a phone interview with Sarah Wayne Callies who plays Lori Grimes in AMC’s The Walking Dead. She was a very nice lady who answered questions very clearly and professionally. In our interview, she addressed character deaths that might happen on the show, including her own. She also had some very interesting insight on a lot of aspects on the show. It was truly a pleasure to be talking with her and discussing TWD (as well as zombies and aliens) with her. WARNING: The following interview contains spoilers from The Walking Dead. Please read with caution. How far do the actors in The Walking Dead know about what’s going to happen to their characters? We talk to the writers at the beginning of each season and we get the broad strokes so we can start making decisions and prepare things appropriately. There are certain details that they keep from everybody. For the second season, Frank gave us the first seven episodes about a month before we started shooting so we can start working on our lines and what’s happening but they kept back the 8th episode so none of us knew about Sophia dying until about a week before we shot that. And it does vary. We’ve had people on the show who were called and told they were going to die and they don’t. And then there are people who’d not been told they were going to die and they die. And that’s just kind of how it works.